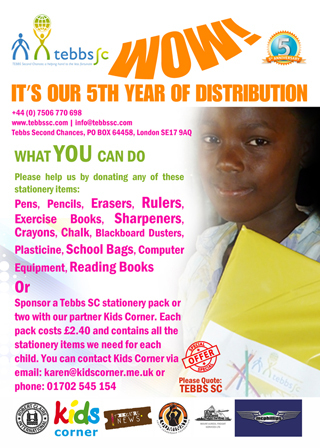 This year Tebbs Second Chances [Tebbs SC] celebrates its fifth year of distributing stationery to disadvantaged school children in West Africa. Since it was founded by Fiona Luke, Tebbs SC has distributed stationery, reading books and computer equipment to over 4,000 children in seven schools in The Gambia and Sierra Leone. The small team of volunteers never tell the school that they are coming along – they just turn up at the end of the school day [to cause less disruption] and make sure each child goes home with a stationery pack. In April 2013 the Tebbs SC stationery drive will be for the SAYO Elementary Primary School in Freetown, Sierra Leone. This year the stationery drive also includes visiting two previous schools and donating school books they have been given from St Edmund’s Catholic Primary School. For press enquiries – interview with Fiona Luke, founder, Tebbs Second Changes, logos and images from previous stationery distribution drives, please contact Sophia A Jackson on sophia@afridiziak.com or call 07855 86 77 78. TEBBS SC offers a helping hand to people who are less fortunate. The ordinary people who are trying to achieve the extraordinary by building their community, whether by schooling children in their homes or in a traditional school environment, but who cannot survive due to the economic climate of the country in which they live.